After the defeat of Nazi Germany in World War II in 1945, Belgium planned to annex parts of the territory along the Belgian–German border. In addition to monetary compensations and the lending of labour forces, this was considered a way of reparations. In mid-April 1949, Belgium surprisingly waived any interest in most of the previously claimed areas. The Aachen neighbourhood of Bildchen (a small hamlet west of Aachen). Some parts of the village Leykaul and several farms in the Monschau district of Kalterherberg. Hemmeres, Winterspelt municipality in Rhineland-Palatinate. The farm Rückschlag near Konzen. The western part of the town Lammersdorf near Simmerath. Furthermore, there are several forested areas in the region between the Belgian town of Elsenborn and the German Kalterherberg. It was planned that the inhabitants of these areas should provisionally remain German citizens in spite of the shifted border. After the war, Belgium had gradually withdrawn her territorial claims. According to the Allied order of 26 March 1949, several populated places and the Vennbahn, which was of special interest for Belgium, should be handed over. However, on 15 April 1949, a sudden change of mind occurred in Belgium. The Belgian government officially declared that it waived the claims to most places and territories that been assigned to Belgium. This waiver was allegedly not the result of the ongoing protest by the state government of North Rhine-Westphalia, but an insight into the inefficiency of the boundary corrections by Belgium. Because establishing the Vennbahn railway would require huge resources over the years, as had been assessed by Belgium, it was decided to refrain from adding adjacent villages to the military administration. Moreover, the Belgian government did not see any support from a majority of the Belgian population for these measures. 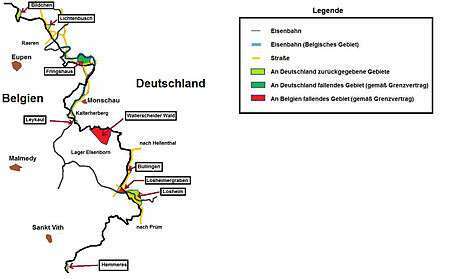 The return of the annexed territories to Germany took place on 28 August 1958 due to a German-Belgian border treaty from 24 September 1956. The place Losheimergraben and the western part of the Leykaul municipality, as well as some forests, were excluded from this restoration. These areas remained in Belgium, and so did the previously Belgian municipalities of Eupen and Malmedy that had been incorporated into the German Reich in 1940. In January 2008, it was announced by Belgian Deputy District Commissioner Marcel Lejoly that the planned removal of the Vennbahn rails could have "international consequences", and it was speculated that the neighbouring areas had to be returned to Germany. But both the Belgian Foreign Ministry as well as the Foreign Office in Germany declared, that the boundaries were ultimately covered by contract and therefore no change would take place. The German-Belgian border treaty of 1956 cited by the Foreign Office does, however, not contain any indications as to what should happen if the railway facilities mentioned in the contract cease to exist. Therefore, the provisions of the Treaty of Versailles that are not superseded still govern the current borders. Moreover, the option of restoring the railway traffic has not been abandoned and also a bicycle route that has been planned on the former Vennbahn track would not change the borderline. ↑ "Karte von der Landesgrenze zwischen dem Deutschen Reiche und Belgien festgesetzt durch den Grenzregelungsausschuß Januar 1920 - Oktober 1922 #20". Retrieved 2013-05-04. ↑ Blank, Bettina (1995). Die westdeutschen Länder und die Entstehung der Bundesrepublik [The West-German States and the Development of the Federal Republic]. Studien zur Zeitgeschichte (in German). Munich: Oldenbourg. pp. 219–220. ISBN 978-3-486-56108-1. ↑ "Belgien könnte Staatsgebiet an Deutschland verlieren – Große Fragen zum Ende einer kleinen Eisenbahn" [Belgium could lose Territory to Germany – Great Questions at the End of a Small Railway]. Tagesschau (in German). 9 January 2008. Archived from the original on 19 September 2008. ↑ "Belgien behält seine Exklaven in Deutschland" [Belgium to keep Her Enclaves in Germany] (in German). Westdeutscher Rundfunk. 17 January 2008. Archived from the original on 17 January 2008. Elzer, Herbert (2006). Zwischen Rheinstaat und Westeuropäischem Bündnis. Großbritannien, Frankreich, die kleineren alliierten Nachbarn und die Besatzung Nordwestdeutschlands 1945 [Between the Rhine State and the Western European Alliance. Great Britain, France, the minor Allied Neighbours and the Occupation of North-western Germany in 1945]. Düsseldorfer Schriften zur Neueren Landesgeschichte und zur Geschichte Nordrhein-Westfalens (in German). Essen. pp. 175 ff. Woelk, Wolfgang (1995). "Das Grenzland von Nordrhein-Westfalen, die Traktatländereien und die niederländischen Grenzkorrekturen 1949 bis 1963" [The Borderlands of North Rhine-Westphalia, the Treaty Countries and the Dutch Border Correction from 1949 to 1963]. Jahrbuch. Zentrum für Niederlande-Studien (in German). Münster: Center for Netherlands-Studies (5/6): 85 ff.